This sprawling 2,265 sq foot, 3 bedroom, 3.5 bathroom condo comes fully furnished with all of the amenities and comfort of home. Floor to ceiling windows with unobstructed ocean views, and wrap around balcony that faces the ocean and sunset. Huge open living area with comfy leather couches for lounging, flat screen TV with full cable, and glass doors leading out to your private balcony. Fully equipped modern kitchen with top of the line stainless steel appliances, ice maker in the fridge, granite counter tops and large breakfast bar. Dining room area that is perfect for entertaining sunset dinners and watching the waves roll in. Every bedroom is equipped with its own in suite bathroom and private balcony. 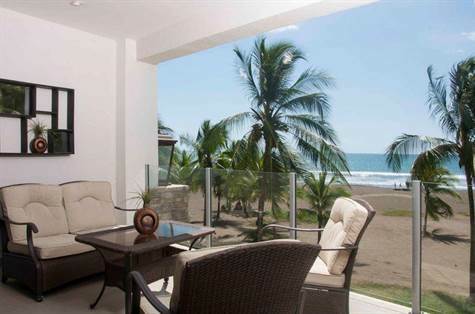 The master bedroom includes a king size bed with flat screen TV, safe, and glass doors that lead out to the main balcony with a 180 degree view of Jaco. The second bedroom has a queen size bed its own private balcony, and the third bedroom is also outfitted with a queen size bed, and private balcony. This is a dream location and excellent rental income producing opportunity! THIS UNIT CAN BE SOLD WITH ANOTHER ONE AT A DISCOUNTED RATE!